Photograph of a portrait of Mordecai Bartley (1783-1870) who served as Ohio's eighteenth governor from 1844-1846. He was inaugurated on December 3, 1844. Bartley succeeded his own son, Thomas Bartley, who became Ohio's seventeenth governor upon Wilson Shannon's resignation from the office. Although Mordecai Bartley only served one term as governor, his administration was very active. The Whigs held the majority within the state legislature. As a result of this, they were able to pass the Kelley Bank Bill of 1845, which stabilized the state's banking system. They also reformed the state's taxation policy. Bartley also became known for his position on fugitive slave laws. Bartley not only opposed these laws but also advocated the repeal of Ohio laws that deprived African Americans of basic rights. 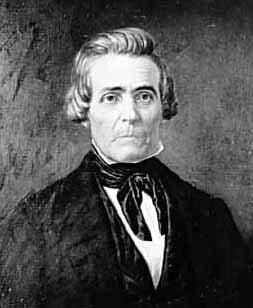 Bartley was governor when the United States became involved in the Mexican-American War. He personally opposed the war but felt that it was his duty as governor to provide Ohio troops for the war effort.